Shelda and Adriana Behar rank as winningest players on the SWATCH-FIVB World Tour. Shelda turned from Volleyball to Beach Volleyball when she was 18 years old. That same year, 1991, she was a passenger in a car that was hit by a drunk driver. She endured muscle damage and the nerve in her right hand was severed. A doctor told her that she would have to give up volleyball. Instead, after an operation, she learned to hit with her left hand, and she returned to the beach. After failing to qualify for a SWATCH-FIVB World Tour main draw three times in 1995 with Isabel Salgado, Shelda teamed with Adriana to start their international career together. Entering the 2006 season, Shelda and Adriana have won more gold medals and earned more money than any other team in SWATCH-FIVB World Tour history. Two-time SWATCH-FIVB World Champions (1999 Marseille and 2001 Klagenfurt), Shelda and Adriana have also claimed to Olympic silver medals (Sydney 2000 and Athens 2004). S ix-time winners of the SWATCH-FIVB World Tour season points title (1997-2001, 2004), Shelda and Adriana have also played in more international events together than any other women's teams since the start of the circuit in 1992. Through the 2005 season, Shelda and Adriana have compiled a 516-102 SWATCH-FIVB World Tour match mark (83.5%) since forming their partnership at the end of the 1995 season. Overall, Shelda has a 522-106 record (83.1%) entering the 2006 season. Shelda and Adriana also captured the 1999 Pan-American gold medal in Winnipeg, Canada. On the Circuito Banco do Brasil, Shelda and Adriana have won the season points title eight times (1996-1997, 1999-2004). She has also been honored as the Circuito Banco do Brasil's top player (1998-2001, 2003-2004), best defender (1998-2001, 2003) and best receiver (1999-2004). Shelda's younger sister (Shaylyn) has followed in her footsteps and won a 2005 SWATCH-FIVB World Tour gold medal in Japan with Ana Paula Connelly. Shaylyn played two events with Adriana in 2005 (Paris and Austria) when Shelda was sidelined with shoulder and back problems. 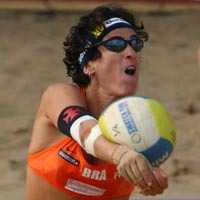 The Bede sistes have won three of the eight Brazilian "Queen of the Beach" competitions with Shelda winning the inaugural event in 1999. Shaylyn has topped the list in 2004 and 2006. Shelda likes to skate, which she considers like therapy. She is learning how to play the guitar.